Which large-format business printer combines high-speed output for correspondence, spreadsheets and reports with high-resolution for presentation graphics, all in a multitude of paper sizes, with the quality and reliability you demand? The Elite XL 40DN™ from GCC Technologies®. the GCC family). 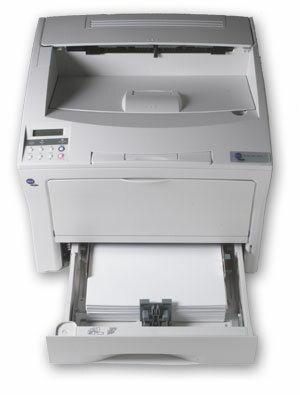 The printer also offers the economy of multiple originals without having to run to the copier. The Elite XL 40 ships with a 500-sheet Main Tray that handles many popular sizes up to A4+ and a 150-sheet Multipurpose Tray that can handle these sizes, as well as transparencies, posters and other media types up to 305 x 900mm. With the addition of the High Capacity Feeder and other optional trays, the input capacity can be expanded to an incredible 3,150 sheets, which minimizes the need to reload and change media. When you need to change toner, there’s nothing simpler or cleaner than GCC’s one-piece toner/drum cartridge. The Elite XL 40DN is also incredibly reliable. It’s been designed to last for well over a half million pages of output. In addition, the Elite XL 40DN offers true multiplatform printing. With both PostScript and PCL languages built in, the printer can handle jobs from Macintosh, Windows, UNIX and DOS platforms effortlessly. The Elite XL 40, with GCC’s exclusiveAccuGray™ II technology, can support both your business and graphics needs with superior image quality. AccuGray II provides crisp, clear and customizable halftone reproduction that is unparalleled. printer that combines speed, reliability, flexibility and higher resolution with GCC’s continued commitment to quality and service, you’re looking for the GCC Elite XL 40DN.